From left to right: Dwarf sawfish, Green sawfish, Narrow sawfish and Freshwater sawfish. Sawfish (family Pristidae) are part of the sharks and rays group. They have a cartilaginous (consisting mainly of cartilage) skeleton have gill openings on the underside of their head, large dorsal fins and an extended toothed rostrum or –– as it is more commonly known –– the ‘saw’. Sawfish have shark like caudal and dorsal fins. Sawfish inhabit freshwater, estuarine and marine waters, with a preference for coastal bays and foreshores. Unfortunately, this preference, in combination with their toothed rostrum, makes them vulnerable to capture in all forms of fishing nets in the Gulf of Carpentaria. Australia has 5 of the 8 species found world wide. There are four known sawfish species that are found in marine, estuarine and freshwater habitats in Queensland waters. This is contrary to the myth by many fishers that only one sawfish species exists and that the broad billed sawfish is female and the narrow billed sawfish is male. The four sawfish species are freshwater sawfish (Pristis microdon), green sawfish (Pristis zijsron), dwarf sawfish (Pristis clavata) and narrow sawfish (Anoxypristis cuspidata). The fifth species found in Australia is the Smalltooth or Wide Sawfish (Pristis pectinata). It is mostly marine and rarely enters rivers and grows to over 7 m, the largest of the sawfish. This species is found elsewhere around the world, for example the African coast. Sawfish numbers have dropped over the years because of pressures from fishing and modification of their habitat. Sawfish are vulnerable to most forms of fishing in particular net fisheries as at any size their toothed rostrum is easily entangled in the mesh. Sawfish are limited in their capacity to recover from population decline as they mature late in their life cycle and produce few young. Sawfish are long lived, approximately 45 years for freshwater sawfish, green sawfish and dwarf sawfish and 35 years for narrow sawfish. Sawfish also have a preference for shallow inshore coastal and freshwater habitats which makes them more susceptible to interactions with humans. These include activities such as habitat modification (weirs) and disturbance from coastal development and water quality issues related to pollution from the land. Sawfish give birth to fully developed pups (ovoviviparous). Litter sizes range between 8 to 24 pups. Sawfish are born at a size range of 65 to 90 cm. The number and size at birth of pups is dependent on the size of the birthing mother with larger parents having the ability to producing larger litter sizes. Sawfish are born with a toothed rostrum (snout) which is covered by a sheathed membrane. The membrane coated rostrum is an adaptation designed to protect the birthing mother from the sharp pointed teeth. Sawfish grow quickly in their first year of life, growing as much as 45cm. This growth rate slows considerably as they reach maturity at approximately 4 years for narrow sawfish and 9 years for the other species. Sawfish are top order predators and will actively seek out prey items such as live fish, prawn and squid, stunning them with a slashing motion of their toothed rostrum before consuming them whole and head first. 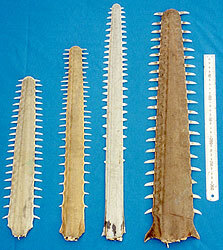 Catfish spines are often found embedded in the rostrum and fish scales impaled on the rostrum teeth of caught sawfish. Sawfish will also eat dead prey and will strike at lures. In many cases lure caught sawfish have the line wrapped around the rostrum.